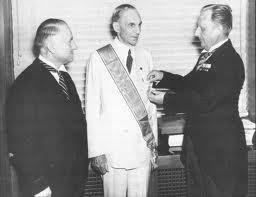 Henry Ford was awarded the Medal of the German Eagle, the highest honor granted to a foreigner. Here we see the consul Karl Kapp, who gave him his decoration in 1938. World War II , an American crusade for freedom and democracy ? The winners write history, this is the version that is taught since 1945 on both sides of the Atlantic. The Normandy landings occurs only very late, June 6, 1944 , will nevertheless of the second world war a tremendous financial windfall for the United States. Also take the time to examine the major players in the financial involvement of American capitalists in the manufacture of the Second World War. 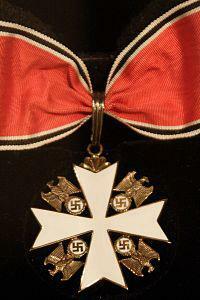 The famous medal awarded to Henry Ford in 1938 by the German Consul: the German Eagle Medal. Like any historical narrative, the official version of the Second World War has a partially fictional character. The work of the historian, who is perpetually revise history, nuance and complexity came the official version written by the victors. The official version of the Second World War offers essentialized antagonism between two geopolitical blocs to completely independent reasons: on the one hand, good, defending democracy, and on the other, the wicked, supporters of the dictatorship. If the Communists, who have changed along the way, overall the exception was irreconcilable and never communicated other than in the conflict enemies blocks. However, evidence of collusion between officials multiple enemies come as soon as we look closely at the facts. 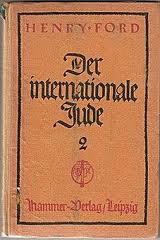 Evidence supports the Henry Ford the Nazi movement: this little book very anti-Semitic printed in German. The links between Nazism and transnational industrial capitalism , including American , are well documented ( General Motors Operation Paperclip , etc. . ) . However, less is known about the links between Nazism and financial capitalism , the famous » cosmopolitan bankers ‘ against which the Nazis themselves yet cried so hard . The name of Warburg sometimes appears . But as shown by the research of Anthony Sutton , a Eustace Mullins or nickname Sydney Warburg, the relationship between the Third Reich and Wall Street or the City were even more intimate and intriquants . Even at the height of the war , Nazi Germany was never excluded from the international financial system of the time (transactions, speculation , etc. . ) . The major international bank , whatever its religious origin, has never declared war on Hitler, except at the margins . On the contrary even , as to arrive at supreme power in Germany in the 1930s , moreover through legal channels , it was necessary , as now , the support of banks and media … But beyond even the obvious connivance from private actors , it seems there has been further complicity at the highest level between States officially at war against each other, namely between the German government, a hand, and the allied British and American governments on the other. Henry Ford also received the « Certificate of German Merit » … during the war. In support of this thesis, we propose the reader documents that may well contribute to undermine completely the history of the Second World War, and thus the history of the world . The Bibliothèque nationale de France offers online internet digital versions of some of its archives , including the underground press circulating in the mantle France during the German occupation. We reproduce below some excerpts and links to full articles, which can also be found in the catalog rating : RES -G- 1470 ( 402). « The Truth »(La Vérité) , No. 55 , December 10, 1943 . « The Truth » (La Vérité), No. 56 , January 15, 1944 . « The Truth » (La Vérité) , No. 58 , February 10, 1944 . « The Truth » (La Vérité) , No. 59, February 17, 1944 . You should know Henry Ford, as Prescott Bush , was part of the Board of BBH (Brown Brothers Harriman , which claimed to be the largest private investment bank in the world ) . Throughout the ’30s , there was nothing illegal in doing business with Thyssen and many American companies , among the best known , had invested heavily in the German economic recovery. However, everything changed after Germany invaded Poland in 1939. Even then , it could be argued that BBH was within its rights continuing business relations with Thyssen , until the end of 1941 , as the U.S. was still technically neutral , at least until the attack on Pearl Harbor. the Nazi war machine have circulated . There is little time , the British newspaper The Guardian gave the results of a very thorough about these » very special » relationships or American capitalists investigation blithely traded with the Nazis while young Americans were being killed in the name of freedom in Europe , while their government cynically trampled the application of the » Trading with the enemy Act » ( the law prohibiting trade with the enemy ) . A trial was held in 2001 in the USA, involving, among others, Ford and Bush families , The trial revolves around an execution order , passed January 22, 1944 and signed by President Franklin Roosevelt, who asked the Government to take all measures to save European Jews . The lawyers contend that the order was ignored because of pressure from a group of big American companies, including BBH , where Prescott Bush was a director … but some U.S. manufacturers continued to work with the same Reich after 1941 ……… ……….. or of the trial. At the end of the war, Henry Schneider , an investigator from the U.S. Army, described the German subsidiary of Ford of » arsenal of Nazism , at least for military vehicles . » According to Schneider , this device had the approval of Ford executives , USA. Recognition of Nazis for Ford and GM was well founded : trucks « Blitz » , produced in a factory built by GM in Berlin , was a major component of » Blitzkrieg » , the German aggression against its neighboring countries : Poland, the USSR and France . Opel , the German subsidiary of GM , Ford and Germany were the first two truck manufacturers for the German military. Without large capital investment by U.S. companies in the German economy , the army of the Reich in 1938 would never have been able to organize , or even think effectifs.L grow its invasion of Poland programmed with Russian communists would have remained as the dream state . Without interventions Howard Bush , combined with those of the Harriman brothers and Rockefeller Zionist Wall Street bankers have left their hands in their pockets rather than going out hundreds of millions of dollars that the German economic machine needed to prowl its new weapons of war. American capitalists chose to start a war to boost the economy bankrupt America … passing over the heads of the people itself! The New World Order was planned and would bring big : U.S. unemployed will be recycled into soldiers …. mouths to feed food banks serve to flesh guns fatten the » battlefield » ! The past is the future, we should be wary of » current American capitalists » as well as the Zionist bankers who did not hesitate to lend vast sums to the Reich, they will not hesitate to initiate a Third World War in order to cash in quick profits , without regard for future consequences! We are all self-defense ! Long Life to the Second American People Revolution ! Thank you for your support my friend!